After yesterday's burnt chicken, (which still tasted great) I decided to do a regular post on What Went Wrong? Some bloggers have Flashback Fridays, Top Ten Tuesdays, and I thought that a good weekly would be WWW. I could do it on Wednesdays...if something went wrong. I am often told by people who have followed my bread recipes exactly, that somehow, it didn't turn out....right. I really do appreciate the feedback...it helps us all be better bakers/cooks! That's because making bread is not exact...there are so many variables involved. 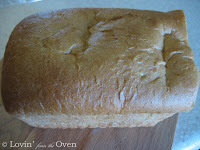 You can follow a bread recipe EXACTLY and it would turn out differently each time. I LOVE recipes with EXACT measurements. It is comforting to know that it will turn out the same way each time. Not so with bread...there's always a range of flour. One day, its 6 cups, another day it's 7 1/2. Try adding ___________ next time. This is my 100% whole wheat bread. But collapsed a little bit in the oven...that's what those little 'dents' are in the top. You can see the 'squashed' top look and the little holes inside. Kinda looks like wheat bread Swiss cheese, huh? Even though it was soft and slightly squished, it still tasted good. Not quite a failure, I guess! I didn't add enough flour. That's why it collapsed on its own weight while cooking in the oven. Some days, I feel like collapsing on my own weight. So, readers/bloggers, bring on your questions, photos, and experiences...I'll post them here, with possible answers/solutions. If you want totally anonymity, feel free to email me. I recently badly underbaked several loaves of cardamon bread. They didn't raise correctly - but i wanted to see if I could salvage them for bread pudding. Because they were more dense than usual - i think i didn't bake them long enough. Is there a standard temp or way of telling if bread is actually cooked all the way through? I did salvage enough for the bread pudding - but it was depressing how much went into the garbage! I miss your posts. I hope you'll be back to baking, cooking, and posting soon. Scate, I am so sorry that your bread didn't turn out! That is a great idea to salvage your bread for bread pudding...other uses could be for croutons or bread crumbs. You can always freeze your bread for use later. 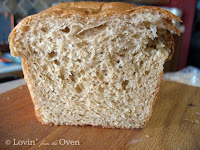 Dense bread could be the result of insufficient rising time and/or too much flour. I have always used the 'thump' method of testing the bread for doneness...if it sounds hollow, it is done. King Arthur Flour suggests an internal temperature of 190 degrees. Check this link (http://sites.google.com/site/printablerecipes/what-went-wrong) and see what you can do differently next time...Good luck!